Do you sing? Play an instrument? Love adventure? 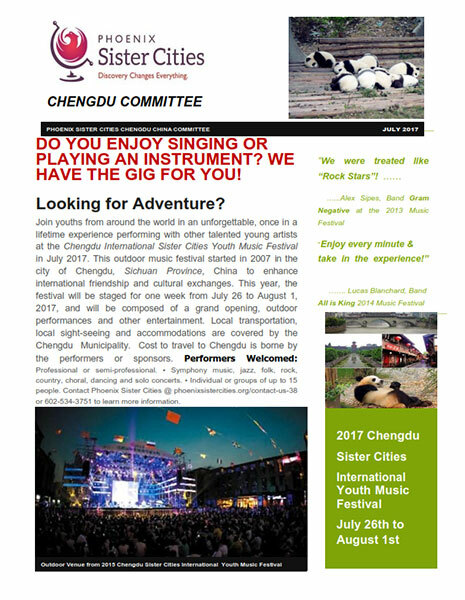 If so, join The Phoenix Sister Cities Chengdu Committe at the Chengdu International Sister Cities Youth Music Festival this July 26 – August 1. Local transit, sight-seeing and acomodations are covered by the Chengdu Municipality. For more information, call Phoenix Sister Cities at 602-534-3751 or click here.